Moins d'une demi bloc de la plage, ce duplex de 4 chambres, 3 salles de bain inférieure a un plan d'étage idéal avec un / salle à manger / cuisine salle de combinaison. Le porche couvert est un grand peuple qui regardent place! Pier de Johnnie Mercer est à seulement 2 blocs au nord Alors faites vos engins de pêche! Douche extérieure. Pour les rassemblements plus importants, réservez l'unité supérieure # W099 (VRBO # 3677303) pour un total de 8 chambres à coucher. Off-street parking pour 2-3 voitures. Occupation: 10. Interdiction de fumer. Pas d'animaux de compagnie. Our experience was great. House was clean and all appliances worked. We needed a hose nozzle for the outside foot wash area and was accommodated timely, and everyone was super nice. Even better we were steps away from the beach!!! Overall, high value for ability to sleep many people. We had 8 staying here and were very comfortable. Initially had issues with rental upon checking (leaking toilet, mold_ which was quickly remedies by Brayant Real Estate by repairing drywall and updaters unit toilet leak and completely replacing moldy drywall on celling. I was reimbursed for the first day as we were unable to stay there. 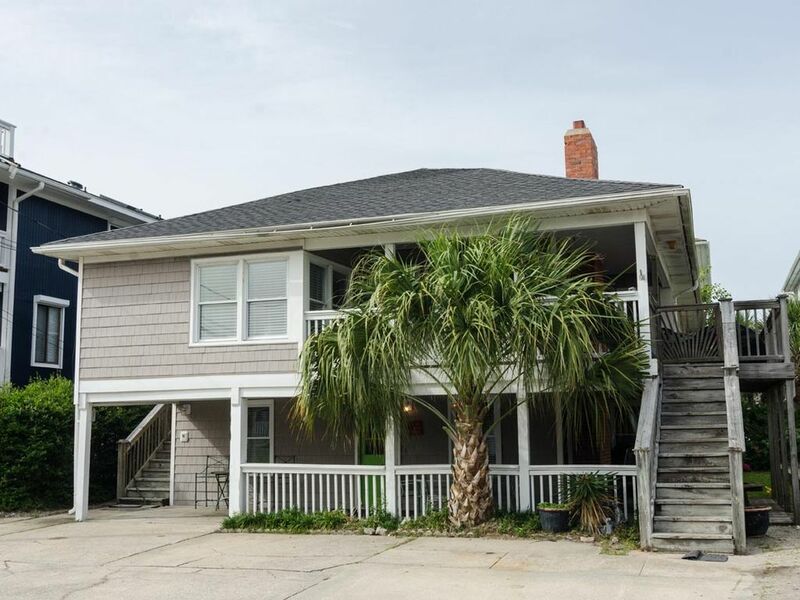 I would rent this unit again if I had a large group and wanted a budget rental in wrightsville beach. Keep in mind this is first floor rental and there is another rental above- some noise from the people renting above on 2 nd floor, not well noise protected. Katie, Thank you for taking the time to provide feedback about your stay! Unfortunately, there was a leak in the upstairs unit which directly affected your property; this was reported to Bryant only a few hours before your arrival. While we do not enjoy delivering this type of news, we sincerely appreciate your acknowledgment of how quickly we were able to resolve this situation for you and your family. We truly hope that you enjoyed your stay and will come back and visit again soon! The rental started with a call before I arrived stating that the door code system was not functioning properly and that I needed to pick up a key from the office. This was not a major deal but the first set of keys I picked up did not work. I picked up another key (Just One as it was a master key and it worked). I was told they would repair the lock but it had problems all week. The gas grill would only work with 2 of the five burners working, but fortunately I brought my own. The changed the tank, but I still had the same problem. The Ice maker in the freezer would only produce 4 cubes at a time (Again not a problem as I brought my own ice trays) and notified them at the end of my stay. Other than that the accommodations were outstanding. The rooms were clean and the items needed to cook were provided (I always bring my own frying pans and cookware to be safe). We enjoyed are stay at this location and plan to book it again next year. Just remember if you have more than 2 vehicles you may have to get creative with parking. We managed to get 4 vehicles in the space of 2. all in all I would recommend this place as it is 150 steps from an awesome beach and it is very quiet during the week. Great place for a family vacation. Hi Bruce, thank you for your feedback! We appreciate your patience as we worked out the kinks. We will gladly forward your comments to the appropriate parties to get this property in tip top shape. Thanks again- we hope to see you back at the beach again soon! Pretty good overall - the location was very good and you could walk to restaurants. The TVs could be better and there were very limited channels on the tv in the living area - could have been user error but with three remotes there is some confusion. I'd add some sound insulation in ceiling - you could hear every step in the upstairs unit. The first 3 days, the stove was not working, it took them 3 days to come out to get it fixed. The location was great. Shawn- We apologize you had stove problems during your stay. The power issue to the stove has been corrected and all is in working order. Happy to hear the location was great for your trip, hope to see you at the beach again soon!